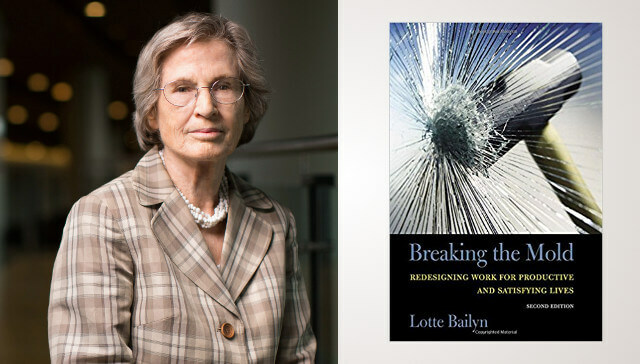 Lotte Bailyn is the T Wilson (1953) Professor of Management, Emerita at the MIT Sloan School of Management. Lotte’s research deals with the relation of organizational practice to employees’ personal lives, with a particular emphasis on gender equity in business organizations and academia. Among her publications are Breaking the Mold: Women, Men, and Time in the New Corporate World (Free Press, 1993) and its new and fully revised edition Breaking the Mold: Redesigning Work for Productive and Satisfying Lives (Cornell, 2006), and Beyond Work-Family Balance: Advancing Gender Equity and Workplace Performance (Jossey Bass, 2002), of which she is a co-author with Joyce Fletcher, Rhona Rapoport, and Bettye Pruitt. 1MFWF: In this country we like to think that we are a meritocracy. But in fact, in our prevailing workplace culture, good performance is not enough; managers also expect an unquestioned but abstract commitment to work. How might that expectation be bad for business? Lotte: Commitment to work is of course important. Managers expect it and employees want to have work to which they can commit, which challenges them and gives them a sense of accomplishment. The issue is the way commitment is gauged—that’s where the trouble begins. If, as is all too frequently the case, commitment is assessed by the hours that a person is visible at the office, by his or her willingness to put work demands above everything else, by being accessible 24/7—if that is the case, both workers and the business suffer. For employees, this kind of expectation makes life pretty complicated. It means being unable to separate one’s work from one’s other activities and responsibilities, finding it difficult to easily plan family events, having no respite from work demands, and being under continuous pressure. That is not good for one’s health (which costs the company money), but also not good for one’s ability to be creative and productive. And that is how the business suffers. Tired workers under pressure are not ideal. Their commitment is more to self-presentation and less to actually accomplishing the work. Presentism, as it has been called, leads to inefficiencies, to unnecessary make-work, to wasted time. Salesmen who have to report back to the office after a day on the road—even if near their homes—are not enhancing sales, but just satisfying a manager’s desire to control their work. And long hours visibly at work do not necessarily improve productivity. On the contrary, research has shown that output per hour decreases as total time increases. And we all know that from personal experience. Very few of us can do good work at the end of a twelve-hour day, nor can we—or should we—be narrowly focused for that length of time. It leads to rigidity and lack of creativity or innovation. So, long hours are not a sign of commitment and benefit neither employees nor the business. Indeed, we probably should redefine long hours as inefficiency rather than commitment. Similarly for putting work demands above everything else. That seemingly sounds good—indeed a management text has defined commitment as just that, putting work first. But is this really good for business? Consider the skills that people learn in their non-work activities. One research showed that African American professionals develop enormous leadership skills in their communities, where they typically are turned to by a large group of family and community members. And women, taking care of a house and children beyond their work, develop skills at multi-tasking, making priorities, and taking responsibility for the schedule and interests of multiple stake holders. These skills are needed by business, but often not recognized as valuable. And putting pressure on employees to minimize their commitment to these outside responsibilities diminishes the opportunity to develop them. So, counterintuitively, not valuing employees’ outside interests and responsibilities misses the chance to import these skills for the benefit of business goals. Finally, continuous access. Clearly desirable? No. In fact, it is this belief that creates much of the crisis mode in our workplaces, the necessity always to be fighting fires. If everyone is always available, there is no need to plan ahead, to make priorities, to understand and learn from failures, to reflect on which work tasks are really important for the business. Too often people reactively respond to whatever seems most urgent, without any thought to its importance or how it fits into the goals of the work at hand. They react on the spur of the moment, interrupting anyone who has information or knowledge they lack, and hence create a sense of chaos and crisis that seems to perpetuate itself. Knowing that not everyone is always available requires a more proactive stand: more thinking ahead, more planning on how to coordinate—in other words, working more effectively. So, it’s not commitment that is the problem, but the way it is gauged. Real commitment doesn’t depend on hours, or presence, or continuous access. Rather, it means responsibility for achieving the business goal one is involved with—acting proactively and efficiently to plan the work and coordinate as needed, not merely reacting to whatever seems at hand. Under these conditions—which enhance effectiveness—neither long hours, nor ignoring one’s personal life, nor continuous access are necessary, are even detrimental. 1MFWF: As you note, according to Parkinson’s Law as well as various studies, work expands to fit the time available—and if constrained, work will get done in the time available. If a person working 30 hours can accomplish the same as they could in 40, managers might say, well then go ahead and work 40 hours and accomplish 50+ hours of work. What’s wrong with that line of thinking? Lotte: My answer here is partly covered by the above. People are just more productive when they are not working long hours and when they have time to also pay attention to their personal responsibilities and interests. But think of what the underlying assumption here is: namely that employee time belongs to the employer. This is a Tayloresque notion, based on an industrial model where people clock in and out. But this may not be the right model for knowledge work, nor is it clear that this external control of people’s time leads to the engagement or the motivation of employees to contribute optimally. On the contrary, we know from the research of psychologists that external control diminishes internal agency, which is just the kind of proactive engagement that businesses are looking for. By thinking always about clock time, hours put in, we reinforce sub-optimal work practices such as face time, presentism, and make-do work. Instead, our emphasis should be on task time, time that follows the needs of a task and doesn’t necessarily align with 9-5 days and 40-hour weeks. By re-thinking time in this way, and giving control over employee time back to the professional worker, it both increases the engagement for work and makes it easier to synchronize people’s personal lives with their work lives. So let’s take time put into work out of our minds and emphasize instead clarifying output and goals and letting people decide with each other how to meet them. That is the best way to optimize engagement, productivity, and life satisfaction, all necessary requirements for an effective business. 1MFWF: You share an example of a woman who has to leave a meeting to pick up her kids. The meeting was slated to end at 5pm, but runs long, and the woman, a program manager, leaves at 5:30 when it’s still not finished. The VP notes, “Don’t worry, we all know about your situation, and no one minds that you have to leave.” Some might say the woman is getting all the benefits of flexibility she could need. But what’s the problem with implementing flexibility in that way? Lotte: The problem for the woman in this scenario is twofold. First, by being absent, she is not privy to everything that is discussed, some of which might be important for her work or the work of the group. Even more important, though, is that implicitly the VP’s comment signifies that her input is really not that important, that the discussion can proceed without her. At least that’s the implicit message in what happened. If he really valued her contributions and saw her as a vital part of the team, he would have stopped the meeting when she had to leave and continued it at a time when she could attend. Such a devaluing was probably not his intention, and no one might be explicitly aware of it. But the sub-text is loud and clear. Symbolically it is there and can diminish this woman’s self-esteem and her contributions to the work of the organization. And this is why individual flexibility is such a problem in organizations. Typically, an employee and her supervisor agree on a flexible work arrangement, usually in secrecy, to accommodate that individual’s particular concern. But secrets are hard to keep and colleagues may become envious or indeed annoyed, feeling they now have to take over more work. In one company, with extensive flexible work arrangements on the book, employees who wanted to take advantage of such arrangements had to write a memo to their managers outlining their needs and desires and their wished-for schedules. But managers were nervous about such arrangements and tended to withhold permission, with the result that requests diminished. Now management could point to this decrease as a sign that people didn’t really need flexible arrangements after all. So absenteeism and lateness and misery and stress continued unabated. In the customer service department of this large technology company we worked with management to convey how this negative reinforcing loop was happening. The insightful director of the division—previously quite controlling—realized that this may be a more general problem that transcends the issue of flexible work arrangements. So he mandated a three-month experiment to allow anyone to have any work arrangement they wanted as long as the work got done. Since almost everyone—including men and non-parents—had a different schedule in mind, the supervisors no longer were able to make individual decisions and had to let their groups decide themselves how to arrange their work and achieve its goals. When absenteeism declined by 30% the change became institutionalized. This example reinforces the need for flexible work arrangements to not be handled individually, but collectively, within a team or division. But this goes against managerial beliefs about control and the need for surveillance, and thus is not easy to sustain. 1MFWF: One of the models of systemic productive change in workplace organization that you cite is Best Buy’s implementation of ROWE, which was relatively new when you wrote about it. But then in 2013, new CEO Hubert Joly eliminated ROWE despite its many successes. How can organizations which make positive shifts protect themselves from the whims of new leadership? Lotte: And here is an illustration of why such practices—which clearly help the business—are so hard to sustain. ROWE is a prime example of collective flexibility, as mentioned above. Researchers at the University of Minnesota, in evaluating the program, found that it not only enhanced the well-being of employees but increased productivity. It provided an incentive to work smart, not long and motivated pre-planning and the avoidance of problems (something hard to measure but immensely important in an effective workplace to prevent crisis and continuous fire-fighting). It clearly met the criteria of the dual agenda: to enhance people’s overall lives while at the same time making the work more effective. So why would a new CEO eliminate this innovation? To understand what’s behind such “whims” of new leadership one need look no further than to the need for control, and to a lack of belief that workers can take responsibility without surveillance. It requires a manager who believes that employees are committed to their work and is willing to guide them with goals and then let them get on with it. And a new manager, particularly with an innovation from his predecessor, is particularly likely to be wary of such change. Though we hear continuously that to manage knowledge work effectively one needs to change from control to coordination, when the pressure is on the instinct for surveillance and control is very strong. My plea to managers is to allow such experiments to exist in their organizations, at least for a fixed period of time, and to measure their results. And if, as in ROWE and the customer service center mentioned above, the results are positive for all—they meet the criteria of the dual agenda—then let them continue and diffuse throughout the organization. 1MFWF: Your book originally came out in 1993. In your revised edition in 2006, you note, “None of the concerns about how to manage productive work along with the care of one’s children, elders, communities—indeed, oneself—has abated; if anything, the pressures are even worse.” We still have a long way (arguably just as long a way) to go, and yet business-as-usual chugs along. Will we hit a tipping point where change happens by necessity (and any predictions as to when?)? Or will it require proactive intervention? Lotte: Probably a mixture of both. I don’t think it will just happen without proactive intervention, but there are some signs of hope. Millennials, soon to become the dominant work force, seem to have a different set of values and goals. Both men and women in this cohort claim that they do not want the stressed lives of their parents. They want to work and work hard, but they also want to have a family and a life beyond employment. This is a good sign. But it may require proactive intervention to ensure that those who feel that way actually move into the leadership positions of our organizations, and this may be difficult. Since, no doubt, there are some of them who would be willing to follow the current rules of success, and since leaders tend to prefer successors who are similar to themselves, the ones we would like to see advance—albeit in a different way—may be selected out. It is not easy for people who have sacrificed to get ahead to envision the possibility of both getting ahead and having a life. Maybe our hope lies with those current leaders who see the struggles of their daughters. Still, collectively, those millennials with different ideas could indeed make a difference. We also see some exemplary companies who are doing things differently. There are law firms who provide a different way of life: fewer billable hours, relaxed rain-making goals. This is great for those in them, but may not be easy to scale up. The firms tend to get their lawyers from the big corporations after they are already trained. They do not have associates and tend to work in niche areas of the law, e.g. family law or real estate. Still, it is an explicit attempt for lawyers to practice their craft without the excessive demands on their time and energy of the typical law firm. There need to be more like them. And SAS, the software data analytics firm in North Carolina, has among the lowest turnover in the industry, despite their relatively lowish pay and diminished routes for advancement. They provide all the benefits that Google does—on site day care, subsidized meals, gym, etc. (indeed, they came first). But in contrast to the bigger firm, they did not lay off any employees during the Great Recession and continued to make a profit. And their lives are more laid back, less geared to competition and overwork. And there is always the hope that national policy in this country will someday catch up with the rest of the developed world and take more seriously the caring needs of the society. It might, in fact be a real crisis in care that may become the greatest catalyst for change. Until then, we can all contribute by working with our colleagues to critically rethink how we do our work. What is it about work that makes our lives difficult? Does it need to be this way? Are there alternative ways of working that are actually more effective and yet can ease our lives? And then work together to try out these new ways. In today’s world the ideal worker—always present, always accessible, committed to work above all else in life—is no longer ideal. And yet the practices that stem from this belief, often unrecognized and taken for granted, are hindering the changes our workplaces need to become maximally effective while at the same time allowing the workers in those workplaces to care more easily for children, elders, communities—indeed themselves; to have time and energy to re-charge; to reflect more constructively on the work and its goals; to be creative and innovative; and to be responsible citizens of this country.